An office without a copy machine is virtually unheard of. Even in the modern push for paperless communication, the copy machine remains a valuable piece of equipment that makes office life run a little more smoothly. Whether it's faxing medical charts or printing meeting agendas, photocopiers have myriad uses, starting with its original use: making copies. The most basic copy machines are used solely to make copies. You can use them to copy photographs or documents of various sizes, and the tops are hinged to allow books, binders and other bulky materials to be copied. Copies can be made in black and white or full color. 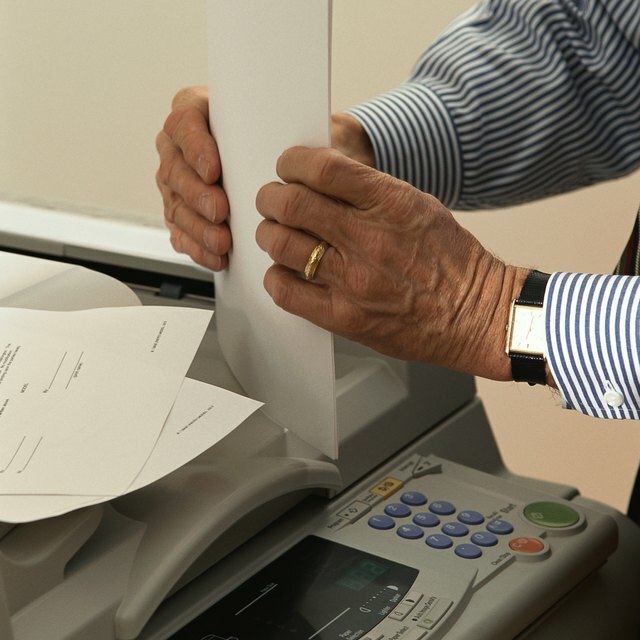 Photocopiers produce a high volume of copies in a relatively short amount of time without sacrificing quality. The quality of the copies produced by a photocopy machine relates back to the technology known as xerography. Xerography uses toner and an electrostatic charge to create dry copies. This prevents freshly made copies from sticking together and smearing, which is one of the main advantages of using a photocopier versus a printer for a large number of copies. As technology has advanced, it's become possible to do more with a single machine. Photocopiers can now do more than just make copies, but the capability of the photocopier depends entirely on the make and model. Photocopiers have other functions that streamline rather menial tasks. You can have the copy machine collate documents a certain way in order to make them easier to hand out as packets, for example. You also have the option to have documents stapled or three-hole punched. Copy machines will also print double-sided without requiring you to remove and flip the paper, as you must do with some printers. You can even enlarge or shrink documents or images, printing an A3 document on A4 paper, for example, or shrinking a photograph to match a frame. In short, photocopiers may have begun as simple copy machines, but they have evolved into multifaceted workhorses. The best copiers for small business owners are those that have the functions you need at the perfect price point. You may find that it is cheaper to have a separate fax machine, for example, but the opposite may also be true – buying a multifunctional photocopier for the office could reflect a savings. Research models and assess your needs before making a decision.